After both of the world wars, a number of army surplus vehicles found their way on to garage forecourts, this was especially true of those designed for heavy vehicle recovery. The theory being if it could recover a Tank, it would not struggle with a commercial vehicle, which even loaded was not going to be more than 20 Ton. However the majority of equipment in use was home made, often just consisting of a rigid jib and a simple block and tackle. Some companies were quite imaginative building coachwork bodies, fancy lockers with flush lights and places for Tow Poles, etc. Maintenance was normally done by the driver in between shouts and he thought he was in heaven if the Workshop Foremen let him have a corner of his precious workshop to do any work on it. It was a matter of great pride to most operators that they built the equipment themselves. Above you can see a typical home made truck, this was a 'second hand' Dodge Pick-up that has had its wooden back removed and a new one built. A crane was then fitted and all the wiring completed before the vehicle was sprayed. The second image shows the finished vehicle on the M25, hours before that section was opened. This was not as strange as it seems today, because bear in mind that back in those days garages still used to fit exhaust and windscreens themselves. If you needed new brakes more often than not, the garage would remove the lining from the shoe and rivet new linings on! So it was fair to say that most recovery operators enjoyed working on their 'pride and joy', because they could enjoy the benefits of that work. As a result of their ingenuity many interesting designs where produced. These would then be copied and improved on by the guy down the road. Engines would often be 'beefed up' a very common trick in the seventies being to put a V6 petrol engine in place of the standard V4 in that extremely popular vehicle the Ford Transit. This was because someone worked out just by fitting a diesel transit front panel, you moved the radiator forward and made room for the bigger engine. There were some garage component manufacturers making things for the new recovery industry like garage equipment supplier Harvey Frost Ltd, of Great Portland Street, London. HF started selling cranes from around.1905, their products actually being made by Ernest Lake Ltd. 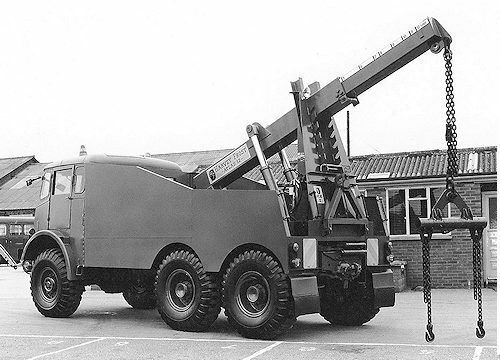 The Legendary Harvey Frost Cat 21 'Pick-Up' Crane, can be seen here mounted on the inevitable Land Rover, along with a Harvey Frost prototype heavy lift crane before it was sold to the BBC. Also worthy of a mention are Mann Egerton, who survived up to 1964, before becoming part of Westinghouse Brake and Signal Co and Eagle Engineering of Warwick. In the United States there were companies like Manley Manufacturing Co and Ernest Holmes Co. In a nutshell, the modern high tech recovery industry we know today, with its large fleets, specialist suppliers and motoring organisations, just did not exist ‘back then’. From those early days a complete industry has grown up in the UK, to supply the needs of recovery men. Super sophisticated rigs costing upwards of a quarter of a million pounds, are not unusual today. You can have equipment built to your specification, or select from a range of ready made designs. Some operates import equipment built overseas, in particular from American, as shown below. Another recent trend is for recovery operators to use motorbikes. Not with a side-car in the way the motoring organisations did many years ago, but as fast city movers. Today's traffic congestion making them very useful for 'first contacts' situations. If all that is needed is quick jump start, wheel change, or 'effect entry', then a motorbike will always be quicker and of course is much cheaper to operate. 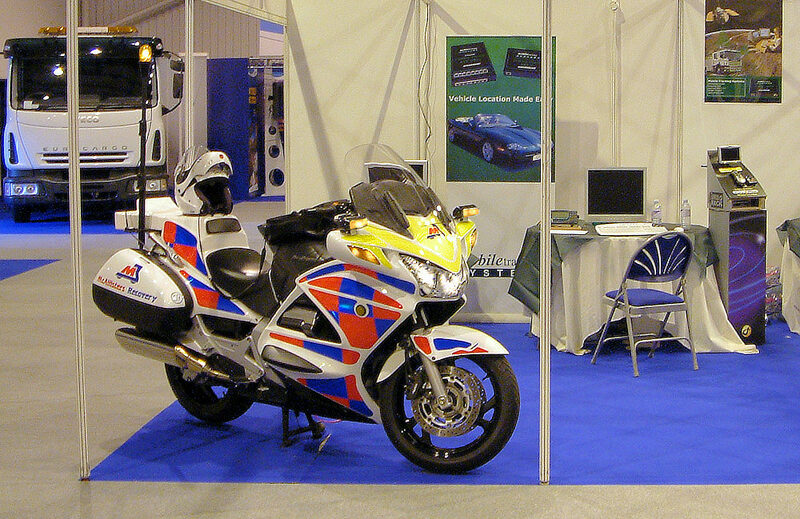 The motorbike shown below was operated by McAllister's Recovery around Hampshire and Surrey and is pictured on the MTS Stand at the European Tow Show in 2005. As has been said before in the early years the Recovery Operator had nearly always built his own recovery vehicles. The cranes were often fabricated in the workshop, or removed from ex military vehicles. 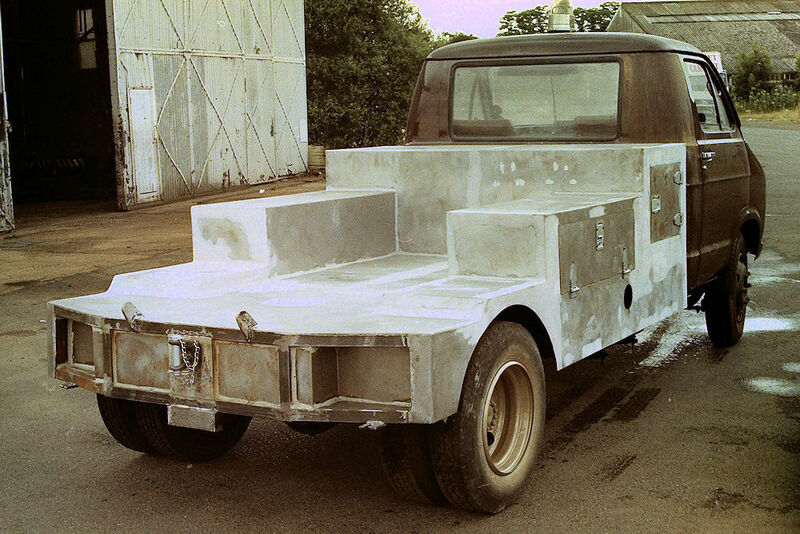 The bodies were folded and then welded up, before the whole thing was painted (usually in white) in their own, or the local tame coachwork's Spray Booth. This started to change in the 1964, when Bill Jackson launched Dial-Holmes a combination of Dial-Mec (his plant hire company) and Holmes the name of the American crane company whose products he was importing. Ten years later this legendary company (with its just as legendary founder), become Wreckers International Ltd of Caxton Hill, Hertford and would eventually ‘turn the tables’ on those yanks and start exporting recovery products to the USA. 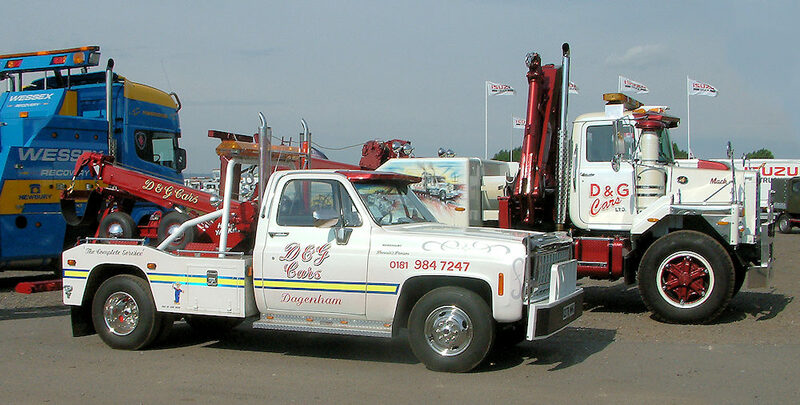 Dial Holmes could supply everything from an American rotating beacon to a fully fitted, ready to work heavy wrecker. They were not the first, but they were the ones that turned it into an industry that independent operators could use. What few customers realised at the time was that most of the English equipment was outsourced and built by contract engineering companies, leaving Dial Holmes free to concentrate on new designs. Another company Brimec (UK) Ltd of Bristol were building the first large scale production UK slide-backs, although initially they were for moving plant, recovery operators soon saw there potential. Trailer suppliers like Weaver Manufacturing and Engineering of Bedford (their parent company was in Springfield Illinois), who had been around since the mid twenties, suddenly found they were selling Cranes, Dollies and trailers at unheard of levels and soon recognised the potential. Notable other equipment suppliers of the time were Dixon-Bate Ltd (made cranes to go on fifth wheel couplings). Tracel Fabrications Ltd (TFL) who produced a great heavy duty crane. Logan Tiffin (who supplied Lights Tapes Signs and Clothing). Ryders International. (Warn winches). Braden Winch Co. Tennant Motor Services (Leeds) Ltd (distributor for Federal and Twin Sonic lights and for a while C F Holmes products). Then there was Cowan Transport Engineering of which Mike Cowan says with a smile "They were a under-funded back-street comedians from Newport Pagnell who became the first (and probably only) UK importers of the BRO heavy under-lifts from Sweden in the early 80’s. These were almost identical to the EKA range later built in large numbers on Fodens for the British Army under licence. CTE imported a number of units from the big 30 tonners supplied to Cowan Motor Group and West Midlands Fire Service among others, to the 6- and 4-tonners and even the small 2-tonne spec lifts. Some were assembled in Sweden on UK chassis shipped out there and others came over in kit form and were assembled over here". He adds "Until the first BRO came over in 1979, the only heavy under-lift in the UK was a 20-tonne EKA unit built onto a Volvo F.88 and operated by Dawson freight a Volvo dealers at Leighton Buzzard. 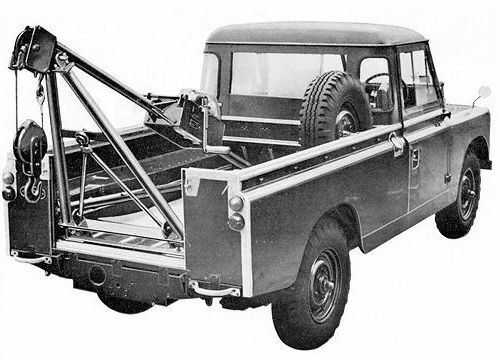 Of course with almost nothing but dozens of Holmes 750’s around, nobody had seen anything like them before This was the start of a revolution in the heavy recovery sector and Bill Jackson very soon saw the potential and began to build his own range of under-lifts at Wreckers International". Crane Fruehauf of Kings Lynn. D G McAllister of Aldershot (MFC Air Cushions and for a short while Mobi-Jack). Heyflake Systems Ltd of Newbury (transporter mainly for the AA). TY-Rite Ltd of Basingstoke (Selling first webbing straps and in1980 the Easylift range of Spec-Lifts from Denmark). Willingham’s of Thorngumbald, who were the manufactures of Mora recovery equipment sold by CVE Limited of Farnham. and of course Roger Dyson Recovery Systems. In the Sixties and early Seventies Recovery Operators thought little about their safety. It was accepted that the job was dangerous one, and few thought to do anything about it. The key to survival was quick reactions. If you heard a squeal of tyres behind you and took the time to look, you could end up very dead. Survivors did not look, they just run and got as high up the central reservation barriers as they could! The AA and the RAC had always provided their patrols with a 'Military Design' uniform. 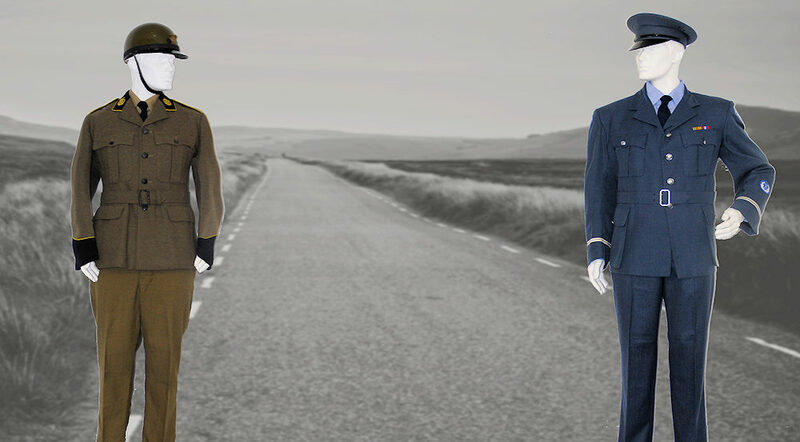 The AA's 'Army' uniform was generally thought of as inferior looking, to the RAC's 'RAF' uniform. However the AA patrols thought their uniforms were warmer, dryer and much more practical for the job they were designed for. So much so, that RAC Patrols were eventually issued with an overcoat that was so good at protecting people from the elements, many garages tried to pinch them! Motorcycle patrols were additionally issued with a basic 'tin lid' crash helmet and of course gloves. There were attempts to encourage patrols to wear a reflective strip and later a waistcoat, but on the whole this was ignored. 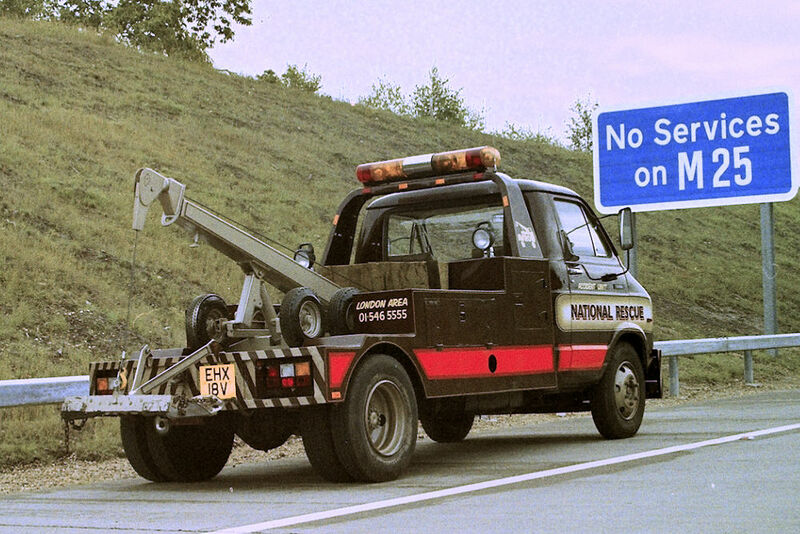 It was only in the mid eighties that the 'hard shoulder services' started to count up the number of fatalities and as a result, they began to look seriously for solutions. In 2004 figures released by the Health and Safety Executive, showed that "three out of five serious motorway accidents, involved a broken down vehicle on the hard shoulder and in 1996 alone, 13 of the165 motorway fatalities occurred on the hard shoulder. One of the trade associations at the time estimated that there were approximately 4-8 fatalities every year amongst Recovery Operators and the Motoring Organisations Patrols". Now, what about the Recovery Operators themselves? Well the picture below from 1983, gives you a good idea of the average attire. Most operators wore overalls as their daily dress, but by the seventies reflective jackets were being issued. Regrettable those that did wear them, did so all of the time and they soon became covered in oil and road dirt! Something had to be done to educate them and several good articles appeared in the industry’s trade magazines. A group of people from the Industry, the Motoring Organisations and the IVR (Institute of Vehicle Recovery), started to produce training videos, largely funded by the Motoring Organisations. These instructive and thought provoking videos were called Life On The Edge. So far, seven have been produced. and it is fair to say that they have helped to save many, many lives. The people involved in creating them, should be very proud of the contribution they have made to safety. In October 1994 Frank McAllister, the then Chairman of the industry's Standards and Safety Committee and (then as now) a man not afraid to say what he thinks, suggested that the industry needed to come up with some sort of national image which included protective headgear as well as clothing. Frank recalls "Initially there were inputs from every corner of the Industry on the design of the proposed new clothing gear , However there was little agreement initially on the design of a new helmet. Many operators seemingly still preferred to look like 'Jobbing Brickies' with a site helmet perched precariously on top of their head. There was also a small amount of 'Big Girlie' opposition to the suggested new design. However after what seemed like a shed load of meetings, operators eventually started to warm to the proposed new look. The new helmet had a safety strap to stop it falling off, therefore in the event of serious connection with a heavy object, it would stay put and protect the wearer. Then last, but not least, it had a shatter proof safety visor, which could be flipped up out of the way depending on the safety issue being dealt with at the time". 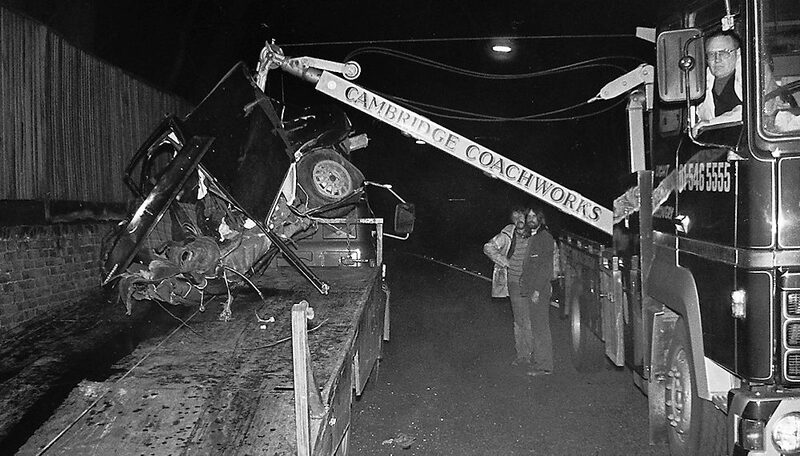 Compare the 1983 pictures with the one on the right and you can see this is one of the very good reason why the number of Recovery Operatives hit by passing vehicles, is now on the decline. The helmet shown is actually the very first prototype production unit which Frank says he used to proudly wear for 'Trade Shows, Official Occasions and Opening Supermarkets'. 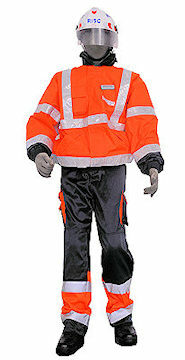 The uniform shown is one of a range of popular two piece outfit that was manufactured by Dickies (UK) Ltd and sold by Cardno Ltd.
Clearly it is important to protect the operative, but if you can give approaching motorist some extra warning, then they may be looking for you by the time they get close. The quickest and usually most effective way to do this is to turn on your Amber Beacon as you approach the scene of the incident. 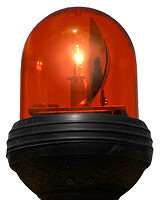 Up until the seventies most recovery vehicles that had a beacon were fitted with a single Lucas rotating light as shown left, but many just relied on other drivers awareness. That particular Lucas lamp shown is towards the end of the design, as the very first ones only had 21 watt filament bulb fitted as also used by the vehicles indicators, or break lights. The Webmaster even remembers driving an Instant Services of Surbiton, Ford Anglia Service Van, fitted with two 3 inch lorry rubber turn indicators. These were stuck on the roof, like a pair of Mickey Mouse ears. The light given out by the early Lucas unit was usable at night, but almost pointless during the day. Being a single light it only took one lamppost or a tree, to hide it from approaching vehicles. On later units, the filament bulbs were replaced with a halogen ones given much more illumination, but causing the battery to go flat if you did not leave the vehicle running. In the seventies dual light units made from two small five inch sealed beam headlights, started to be imported from America. These were soon followed by four headlight units. Then the first of the 'Bar Lights' started to appear, again from America, which meant that it was much harder to for the lights to be obscured by a tree or a lamppost. In the UK Britax produced a fibreglass budget priced full width bar light and companies like Bryn Tennant's “Tennant Motor Services” also started to build a UK version of the American units, they were already importing. Unfortunately as the lights got bigger and brighter, the current drawn also went up, with some units drawing in excess of 50 Amps! Even with the engine running it did not take long to flatten the vehicle battery on tick over. Just what you don't need to happen when you are up on the Yorkshire Moors in the middle of the night! Today's light bars get round the excessive current problem, by using more efficient LED (Light Emitting Diode) technology, that give off brilliant light but drawing much lower current. At typical modern unit is shown above note the built in work-lights.